Size: 1588 sq.ft. - 2759 sq.ft. The "Water Homes" is the newest attraction at the Dubai Canal, Marasi Business Bay. Marasi Waterhomes are being developed by Dubai Properties. Marasi Business Bay will have 250,000 square metres of open space, over 100 shops and outlets, covering an area of 16K square metres, The Park will cover a 60K sq meter area and it is divided into three themed areas - The Pier, The Yacht Club and The Park. The project is expected to be completed by 2020. Marasi Waterhomes are luxury waterfront living in the heart of Business Bay. The waterhomes are the first of its kind in the Middle East having incredible panoramic views of Dubai Canal. Luxury finishes and modern design of 2, 3 and 4 bedroom waterhomes.2 Bedroom total area is 152.1 sqm Deck, 3 Bedroom total area is 244.9 sqm Deck & 4 Bedroom total area: 256.3 sqm Deck. Ten water homes, two restaurants and a yacht club coming to the city. It is a true innovation in residential development and exclusive lifestyle proposition. The waterhomes are the first of its kind in the Middle East. 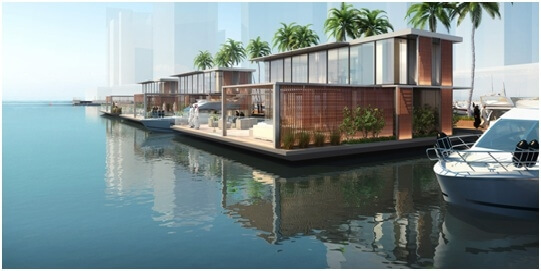 Each home will enjoy exclusive boat access and the views of the Dubai Water Canal. It will encompass expansive green spaces, business units, retail units, unique dining experiences in the form of floating restaurants. The marinas accommodating berthing for 1,250 yachts will provide a spectacular view and a unique waterside destination concept which is not seen previously in the UAE. The UAE's first ever Waterhomes are situated at Business Bay in a quick access at Dubai Water Canal, UAE. At Business Bay, Marasi Waterhomes there are multiple amenities on offer for the residents like 24-hour Security, Internet access, Emergency, Petrol Station, ATM, Biking Track, Marble Floors, Children’s pool/ Play Area, Department Store, Swimming Pool, CCTV Cameras, Cafe, Private Marina Berth, Parking, Restaurant, Post Office, Close to shopping malls.